Peanut Butter Cookie Cake - Chocolate Chocolate and More! 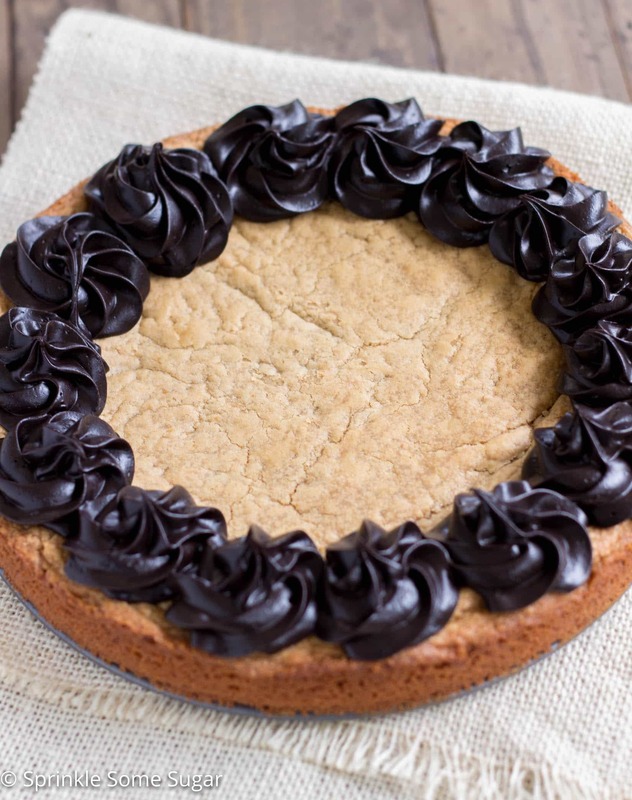 A thick, chewy peanut butter cookie cake topped with a creamy dark chocolate frosting. One of my favorite desserts to make that is acceptable for pretty much any occasion is a cookie cake. Call me lazy, but they’re just so much easier than making a bunch of individual cookies. A combo that is sure to please just about anyone is chocolate + peanut butter, especially if you’re my fiancé! He usually bypasses most of the desserts I make, but if it’s peanut butter and chocolate it’s a totally different story. 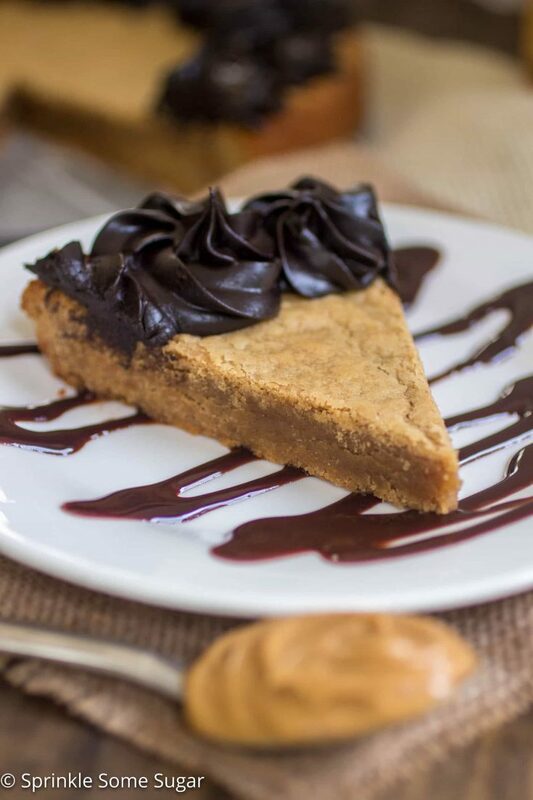 I took my reader-favorite peanut butter cookie recipe and transformed it into this cookie cake that comes out super thick, chewy and SO full of peanut butter flavor! Seriously, the peanut butter flavor is unreal, there’s a whoooole whopping 3/4 of a cup in there. The frosting on the edges is my all-time favorite chocolate frosting ever! It’s an old Hershey’s recipe that is tried and true and it’s simply amazing. It uses dark chocolate powder to give it a deep, delicious chocolate flavor. What makes it different and unique from other frosting recipes, is that it uses melted butter! Using the butter in this state gives the frosting a super smooth, creamy and glossy texture. To make this cookie cake, the dough comes together in one bowl and gets pressed right into a greased pan to bake. Super simple and easy! The frosting is extremely easy to whip up too. To garnish the cookie cake, I usually like to cut mini reese’s cups in half and stick them in each little swirl of frosting (not pictured). You can even drizzle some chocolate syrup or melted peanut butter on top too! 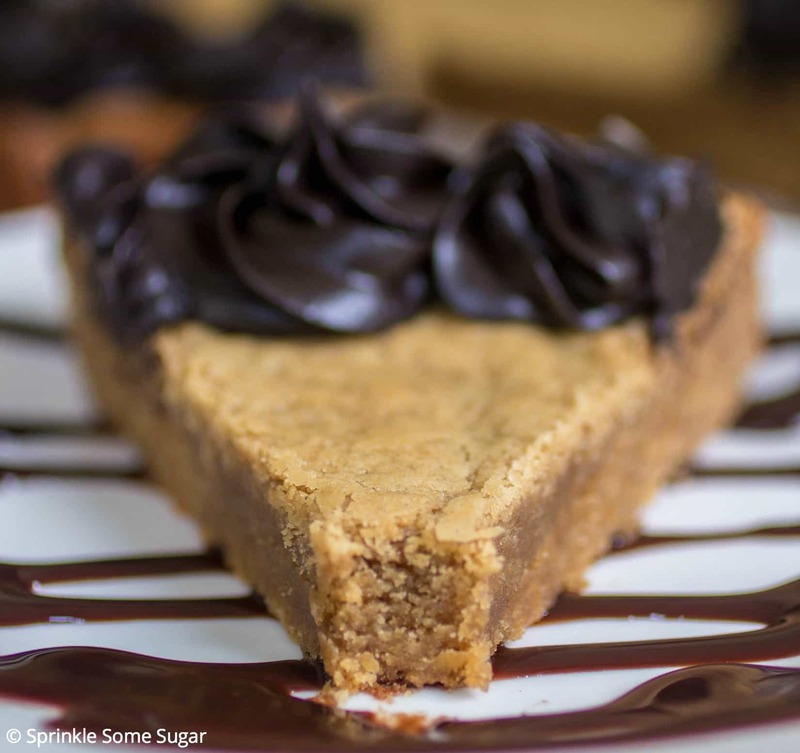 Make this peanut butter cookie cake for a quick and easy dessert for any occasion! Preheat oven to 350 degrees. Grease a 9" springform pan with non-stick cooking spray. Optional: cup out a parchment paper circle and place in the bottom of the pan. Cream butter and brown sugar together until smooth. Beat in the egg,vanilla and peanut butter until completely combined. Pour in flour and baking soda and mix until just incorporated without over-mixing. Dough will be very soft and sticky. Spoon dough into prepared baking pan and pat into an even layer. Bake for 20-25 minutes or until the edges are set and the center no longer looks "wet". You WANT this cookie cake to be underdone, once it sets it will be super soft. Once done baking, place pan on a wire rack and remove outer ring of springform pan immediately. Prepare frosting: Melt butter and stir in cocoa and confectioner's sugar. Stir in vanilla Add milk one tablespoon at a time and beat frosting until you have a smooth consistency for piping. Pipe around the edges of the cookie cake or simply spread on top in one layer. Cookie cake recipe adapted from (myself) Sprinkle Some Sugar. This looks GREAT! 🙂 We love eating cookie cakes at our house, and we love peanut butter too! Perfect! absolute utter PERFECTION! Loooove that this cookie cake is pb!